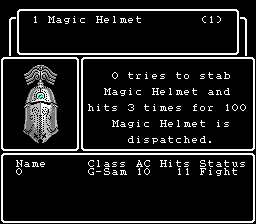 NES Wizardry II: The Knight of Diamonds (USA) in 01:11.32 by MiezaruMono. This game, the second in the series, is the direct sequel to Proving Grounds of the Mad Overlord. Here, the heroes thoroughly explore a dungeon to collect five pieces of the mystical equipment of the Knight of Diamonds to trade for the "Staff of Gnilda" to save the kingdom. With the aid of heavy luck manipulation, the average viewer will have absolutely no idea what is going on as the heroes blaze through the dungeon, score every critical hit known to adventurer-kind, and walk away from this normally hours-long game in the span of two minutes. A bot was used to create large portions of this run; as such, the rerecord count has been removed from the submission entry. This is an improvement of 90 frames from the previous movie done by the same author.